H.B.G. Casimir's life, interests and works are intertwined with the important developments that have taken place in physics during this century. 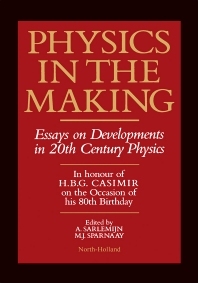 This book was compiled by his friends and admirers in honour of his 80th birthday and concentrates mainly on Casimir's achievements in the field of physics, though without ignoring the peripheral areas of the history and philosophy of physics in which he was greatly interested. The book is divided into four parts. Part I describes Casimir's teachers, Ehrenfest, Bohr and Pauli, and will be of general interest due to the key role which these physicists played in modern developments. The articles do give new facts and provide new insights into the history of modern physics. Part II consists of essays on recent developments in various areas of physics in which Casimir has taken an active interest, such as the modern concept of time, statistical foundations of electrodynamic theory and field theory. The subjects covered in Part III have been selected because of Casimir's efforts in the industrial research area of physics. They cover past, present and future expectations in research. Part IV contains an essay which discusses a philosophy of physics currently under discussion, which states that phenomenological laws prevail over fundamental ones for the purpose of experimental and technical physics. A second chapter in this final part gives a critical analysis of this philosophical view. The book is concluded by an appendix discussing Casimir's activities as a lecturer, written by a former student. Preface. Introduction: 1. Factors in the development of modern physics (A. Sarlemijn, P.A. Kroes, F.W. Sluijter and M.J. Sparnaay). Part I: Historical Examples of Physics in the Making. 2. Physics in the making in Leiden - Paul Ehrenfest as teacher (M.J. Klein). 3. Physics in the making in Bohr's Copenhagen (A. Pais). 4. Physics in the making in Pauli's Zürich (K. von Meyenn). Part II: Theoretical and Experimental Physics: Reports on Recent Developments. 5. The physical concept of time in the 20th century (P.T. Landsberg). 6. Statistical foundations of electrodynamic theory (L.G. Suttorp). 7. The role of Onsager relations in the development of thermodynamics of irreversible processes (P. Mazur). 8. Dynamic symmetries and supersymmetries in nuclear and particle physics (F. Iachello). 9. The Casimir effect - 9.A. Historical background of the Casimir effect (M.J. Sparnaay). 9.B. The Casimir effect in field theory (B. DeWitt). Part III: Physics in Industrial Laboratories. 10. The development of fluorescent lamps at Philips up to 1940 (J.J. Hutter). 11. Approaches to science in industry (K.A. Müller). Part IV: Reflexions on Physics in the Making. Fundamental laws and physical reality (P.A. Kroes and A. Sarlemijn). 13. A philosophy of physics in the making (C.F. von Weizsäcker). Appendix - Casimir's teachings in Leiden and in Eindhoven (C.M. Hargreaves).